I don't know how it took me so long to discover blogs and blogging. I love looking at everyone's pages, projects and more. I have been so busy looking and reading I forgot all about my facebook friends. Some of my favorites......... of course Leah Day and the Free Motion Quilting Project. This is what got me started with the blog. 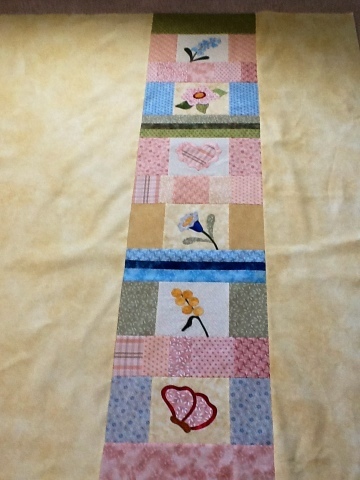 I HAD to have one to link up my projects...http://freemotionquilting.blogspot.com/. I have been going to her site for years looking for a perfect FMQ pattern for various quilts as I was working on them. 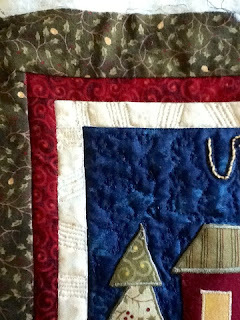 She is such a wonderful artist and her love of quilting shows in all she does. I just found inspiration for a section of my WIP on LuAnn's blog from her sketch book. lizofdandeliondaydreams has a great blog and has got me thinking that tote bags would make some great gifts this year for Christmas. This is what I am working on this week....my UFO, Up on the Rooftop, I made this years ago and hung it on the wall in my craft room never FMQing it because I was not skilled enough. Well with UFO Sunday I got it out and I am pretty happy with my skills now. Not perfect but on my way. 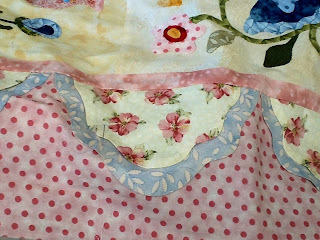 I have used spiral knots, queen of hearts, loopy lines and cucumber vine, all by Leah and the design on the sashing was from LuAnns sketchbook. Still,working on my Fantasy Flowers, hand appliqueing the scallops down, gonna take another 22 hours to finish. My goal is an hour a day after work during my TV time. Gotta watch my Chelsea Lately!! I did finish the back and it is pressed and ready to go as soon as I finish those scallops. I did contemplate machine stitching but since I spent all that time on the blocks I wouldn't be happy in the end if they didn't match the rest. I love your Christmas quilt. And the hand applique one is very impressive. You do lovely work. 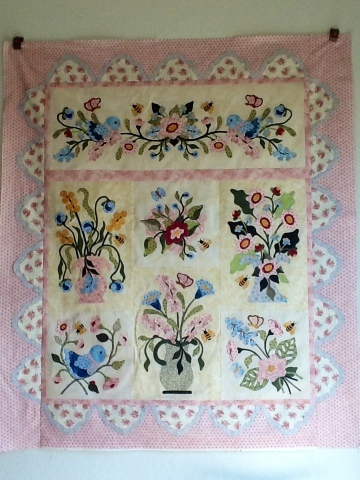 Your flowers quilt is beautiful! I love so many blogs too. Leah is amazing, I learned a lot from her. One of my favorite blogs is blue elephant stitches, and 1/4inch mark. I have about 40 in my RSS feeder on my yahoo. So I can scan all these blogs looking for recent posts. Wow I keep finding all these great blogs, they really inspire me to get creating! Yes, blogs are great fun! I only discovered them a few weeks ago and, like you, had to make my own. Still learning. Yes, I think Leah is the queen of quilting! 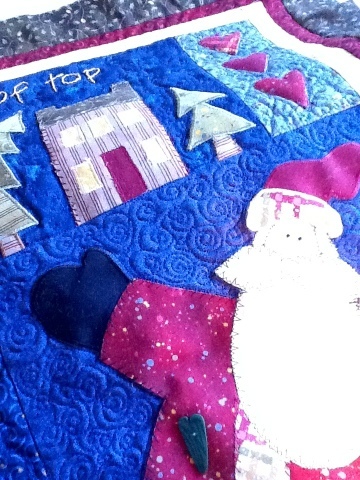 Your Christmas quilt is wonderful! 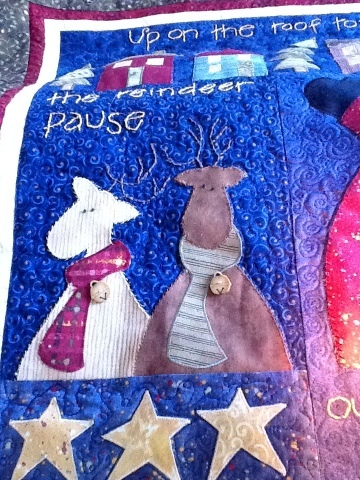 Oh my goodness- your Christmas quilt is adorable!! I have a project from that Nancy Halvorsen on my to-do list for this fall... you are inspiring me to make that one now! Too cute! !